This slide is perfect for any occasion! Riders scale the climbing wall, then slide down. This bright and colorful ocean theme is eye-catching and perfect for your San Diego event! Looking for the Waterslide version of this slide? 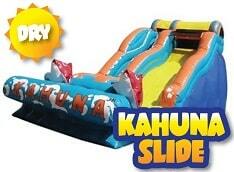 Check out our Big Kahuna Waterslide!